Finally free for two weeks, mid term exams over and two weeks to mess around. But now I actually have free time no idea what I'm gonna do, any suggestions? Unfortunately our spell of snow has lifted, so now its hail and rain (and wind!) for the rest of the week. Eh maybe I should try and make one of these. So cute it could just explode. Wanted one of these since I saw it, looks like (as with most things) if you really want something you need to get or make it yourself. Should I try sewing this up during my holidays haha? I actually have a friend that's a steamstress maybe I should commission it or something. Anyway, try and have a more insightful update next time since I have free time now. Take it easy guys and gals. oooh my god, i love that cute baneling thing. And I want it. bad. Have fun with your free time. That thing does look adorable, I'd have to recommend trying to make one. It's practical, and you'll feel good if you can pull it off. You should make it and post blogs as you make it telling us how its done! Enjoy your free time, shame about the weather though. interesting blog, i like the NZ pics in the previous post. That thing creeps me out, I think it's because I mainly played with Protos. that would be sweet to make, enjoy the free time its always golden. Looks cool, man! You should make more! 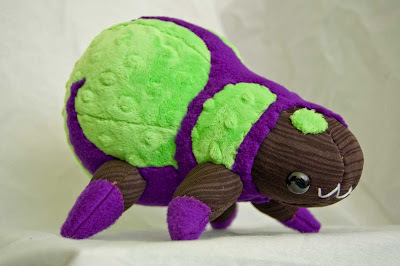 That is an adorable baneling! Enjoy your free time, love the pic.